The back of this blouse is SOOO cool!!!! I LOVE the pleats - how graceful that makes this blouse! Of course, I made changes to the blouse. I moved the neck opening to the front and make the collar continuous in the back. With the neck opening now in the front, I used a button rather than hook and eye. Check out the topstitching!!!!!! 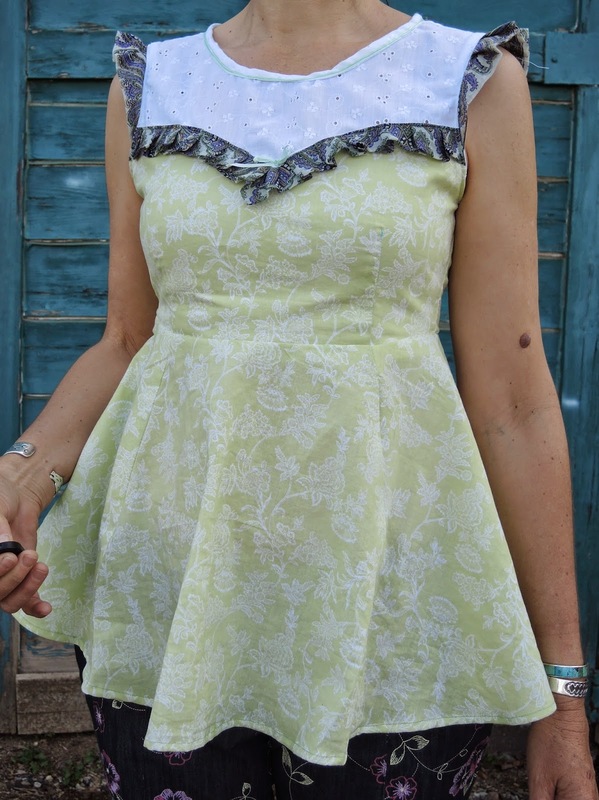 I used a white eyelet fabric too protect me somewhat from the sun when I am working in the HOT sun! The only time I was NOT gardening was during and after this gorgeous rain we had the last couple of days!!!!!! Which gave me time to sew and take photos! 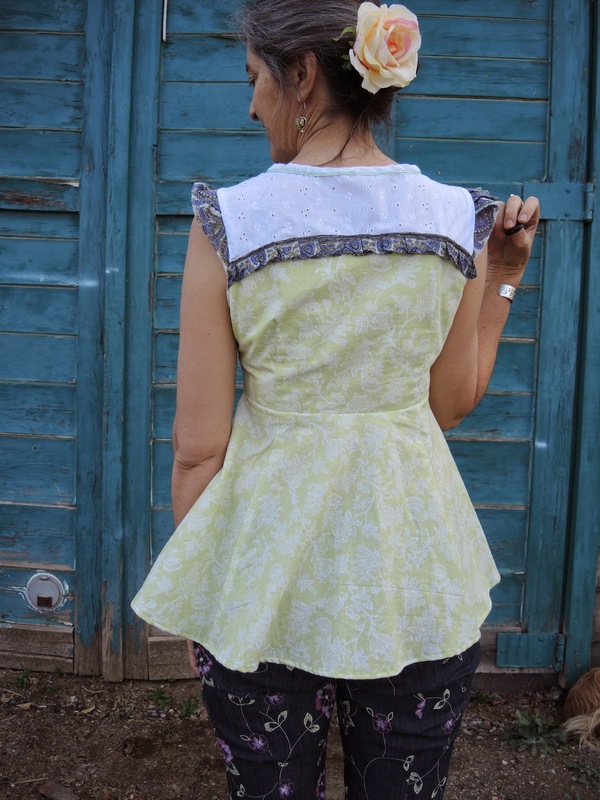 I can't get enough of the back of this beautiful blouse! OH how I LOVE topstitching!!!!!!! I made a change to my perfect Tee - making it even more perfect!!!!! The cool thing about this pair of Oh La Leggings from http://papercutpatterns.com/ is that I used a stretch cotton knit denim. I LOVE this fabric because it is very stretchy but thicker (hopefully more durable) than a regular cotton knit fabric. I found this fabric at http://www.girlcharlee.com/knit-fabric-c-90.html but they don't have anymore! If anyone knows where I can get more of this fabric let me know! Did you notice the whole time I was taking these photos my cat, Hatchet, was stalking something in the background! This week I finished the Ava blouse from www.victorypatterns.com. To go with the Peter and the Wolf Pants from papercutpatterns.com. These are my first pair of jeans! I am happy about that and I love the stretch denim! The detail on this pattern is great. Side pockets and a cute finish at the end of the pant leg. I am not crazy about the way the front waist band goes straight across my belly especially when I sit down. It's just not comfortable. I took a lot off each pant leg to slim them down and made a few other changes. They still don't fit me right but I'm not going to keep changing them until I am ready to try some radical changes to the front waistline. This is also my first try at the Ava Blouse. I love this pattern. I only had to take off about an inch at the top of the side seams. The details are wonderful! I love the pleats above the bust and as sleeves! The top bust is so great the way it can be a sheer fabric while the low bust can be non-see-through. The white I used is a little more sheer than you can see in the pictures. 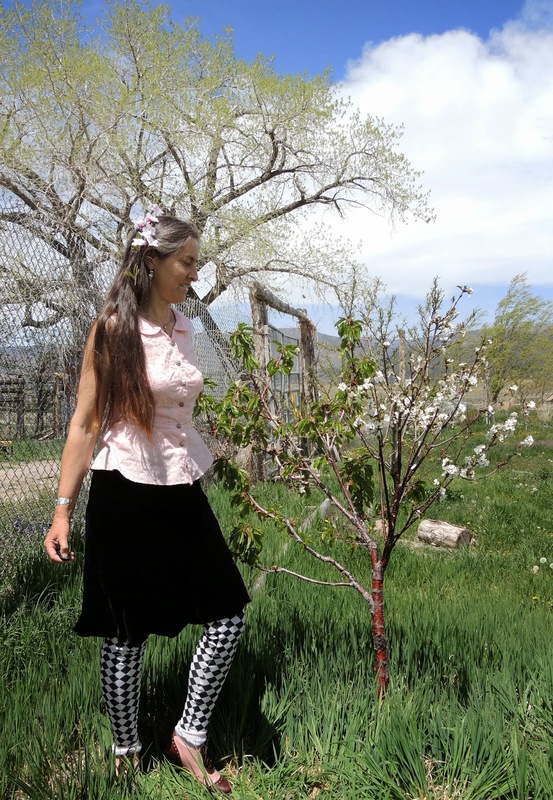 Spring blossoms are here and it is time for pink! Thank God for new energy and aliveness every spring! It's a real treat when I make something from a new pattern and it fits right away!!!! 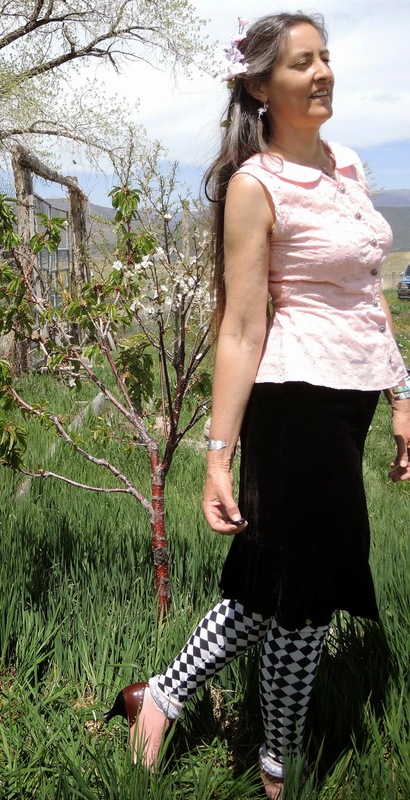 This pink eyelet top was the first try for the Hawthorn! I made only a few small changes. I rounded the collar and took a little off in the armpits to give my arms more room. But that was all!!! I LOVE these leggings!!! 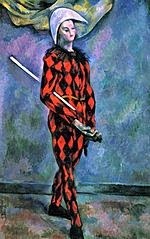 I have ALWAYS wanted diamond print leggings preferably red and black because of Cezanne's painting Harlequin. It anyone ever comes across any red and black diamond stretch velvet or red and black diamond knit fabric let me know because I want a suit like that! Oh well, I am happy with black and white diamonds for now! This is the good old kwik Sew leggings pattern. I cut off a lot to narrow the legs for a skinny legging. The skirt I did not make. Clearly, I need a black skirt so I hope I will get to making one soon. But I did plant the fruit trees and I am VERY proud of them! Again, my favorite shoes from www.fluevog.com! 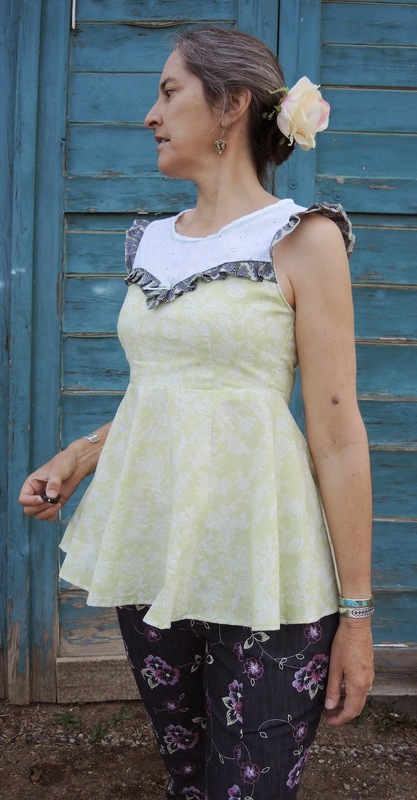 I'm back in a new "Lady Skater Dress" and spring is springing! I have made about 6 versions of this easy knit dress and I wear them all the time! The pattern is by kitschycoo.bigcartel.com. The biggest change I made was to add a peplum. I LOVE Peplums I feel they make a more graceful transition where top meets bottom. The second big change I made was to add a lining when I am using a sheer fabric. I really dislike it when knit fabric is see through - What good is that! It makes getting dressed more complicated! I like it to be easy to decide what to wear! Just slip it on and lets go! One of my favorite things about these Lady Skater Dresses is that I can just pull it on and be comfy and done! I have made three different sizes of this dress because it totally depends on how stretchy your knit is - the more stretchy the smaller size the less stretchy the larger size. This black and white bird knit has not got much stretch at all. Of course, when sewing with knits always put clear elastic in the shoulder seams and in the waist seam. It's important to have that extra support and stretch to keep it all looking right. I don't like the way it gets a little to thick in the waist band here with a lining, peplum, and elastic - too many layers - but what can you do! 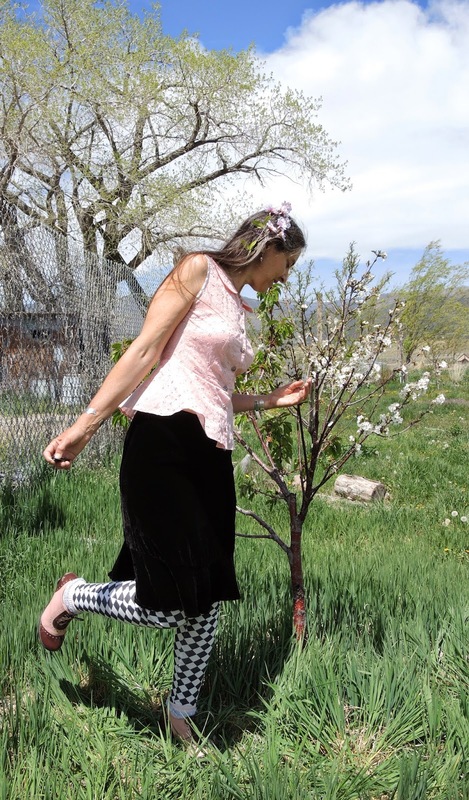 Yes, again the " Ooh La Leggings"! this way cool legging pattern can be found at papercutpatterns.com. I have finally perfected the waist band - by NOT using elastic. I don't like the feel of elastic on my waist! So, I lined the waist piece with a supper stretchy Lycra that gives the cotton leggings better recovery at the waist. I cut about an inch off the top waist to bring it down some. This leaves a nice smooth line under my dress! For the leggings it is best to use a knit that has a good 4-way stretch. They are just more comfy that way! I also took about 3 inches off the length - they were supper long and I don't like them to bunch at the bottom if I am wearing them inside my boots. The shoes are just the coolest! I don't get a chance to wear heals much anymore because of life in the country and garden but when ever I get a chance I wear Fluevogs! www.fluevog.com The MOST ADORABLE shoes in the world! I took a couple inches off the front of the Lady Skater Dress so that it has a bit of a cascade. I got the fabric for both the dress and the leggings from www.girlcharlee.com.